First made available to the public in 1971, this synth continued to be produced with very little change for over 10 years. Considered the most popular synth ever by some there's no doubt the instrument has led a prolific life, leaving a massive wake in its path; changing perceptions and influencing synthesizer design to this day. 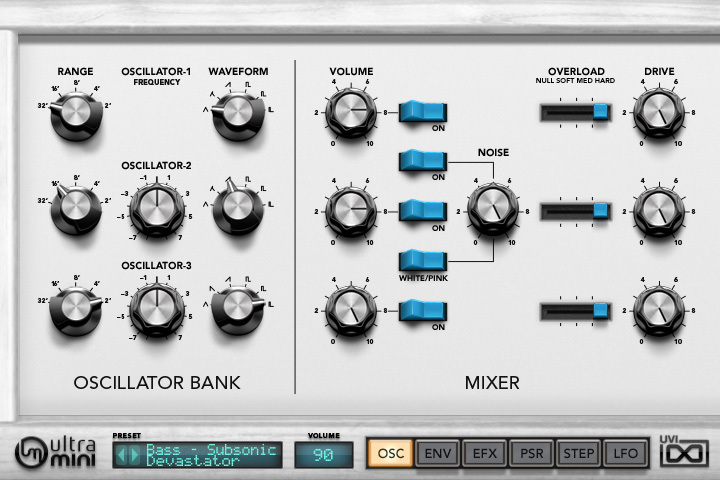 With a striking balance of simplicity and sonic range it was one of the first real novice-friendly systems, a factor that surely contributed to its success and also made it a superb tool for teaching the basics of subtractive synthesis. Being one of our favorite sounds of all-time, we create the UltraMini - a testimony to the timeless sound of a luminary synth pioneer. UltraMini is a high fidelity sample-based instrument based on the most iconic analog synths in the world, produced using real circuits from the real machines. The sound of the instrument is authentic from the start, with accurately modeled filters and effects providing a DSP backend to allow shaping and control of the sound–spending precious CPU cycles only where they're needed. For this approach to work you need to build an amazing library of samples, and this is exactly what we've done for UltraMini, with hundreds of man-hours spent meticulously multisampling and editing the sounds to perfection. We started with the beautiful 1971 model, sampling every waveform of every oscillator across every key - and we did this for multiple overdrive settings. UltraMini seeps with a thick and immediate analog sound produced with the same 3-oscillator configuration. But we didn't stop there. In 2002 the king of mono synth had a second coming; this version has its own wild character and we figured, what better way to make a Mini ultra than to give you two of them. Taking the new 2011 model, we performed the same comprehensive session creating an identical sample footprint. UltraMini includes both of these fully-independent instruments with uniquely skinned GUIs, giving you the choice of vintage or modern flavors. Controls are presented in an easy-to-understand layout, grouped for efficient and intuitive operation eliciting the feel of a real analog synth. 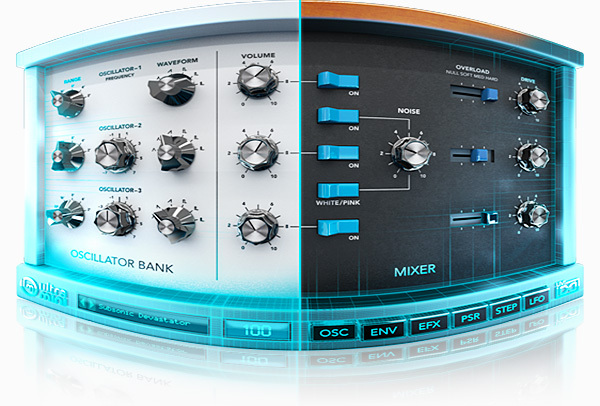 Additional features include analog-modeled filters, amplitude and filter key-follow, unrestricted polyphony, mono retrigger, per-oscillator amplitude, stereo, color and drive control, a built-in bit-crusher, phaser, delay, limiter, our advanced algorithmic reverb - Sparkverb, built-in phraser and arpeggiator assignable per-oscillator, step and LFO modulators and a huge library of expertly crafted presets to explore. 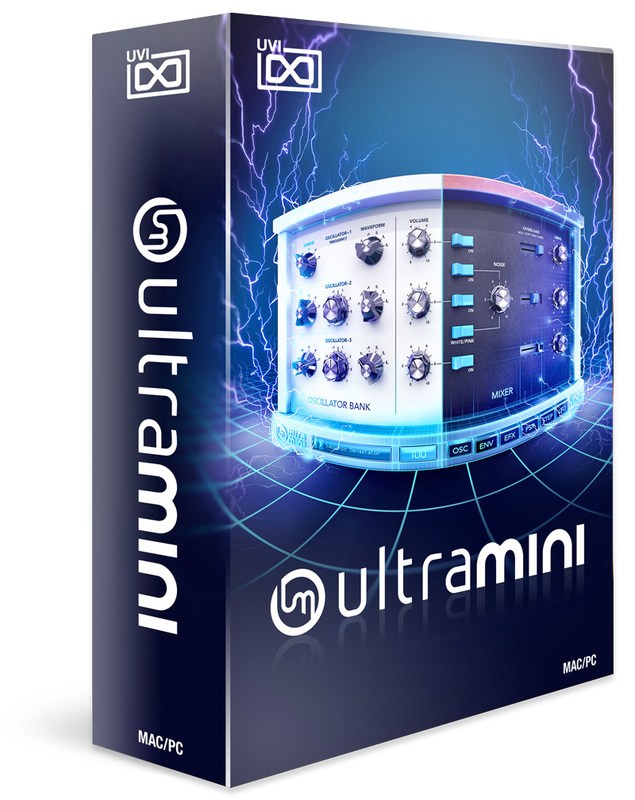 Whether you're an analog aficionado or just looking to add a sonic giant to your studio, UltraMini won't disappoint. 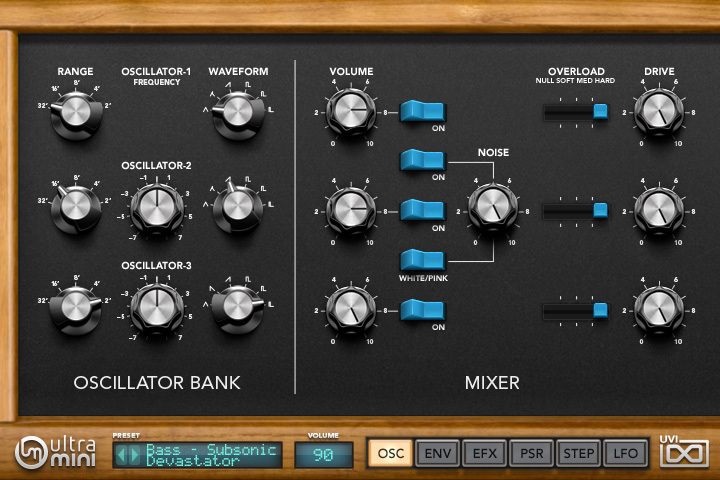 A preset-packed, tweaker friendly ode to the arbiter of analog.